Well, this past week’s snow storm turned out to be much bigger than I anticipated. I don’t recall much hype beforehand, but perhaps I missed it! We were fortunate to have power back very quickly, so by the time we came home on Tuesday evening, our house was cozy and warm. Thanks to Justine for caring for our cat and filling the bird feeder, plus doing some shoveling. We greatly appreciated Mark Savery’s help in plowing the driveway twice! The devastation in the area was dramatic with damage to the small Town plow truck, the demise of a Sheriff’s cruiser, many downed trees and wires, just to note a few mishaps. I think the everyone in town has power back now (Friday), but many lost freezer contents during the outage. This seems like the perfect opportunity to mention the Plymouth Memory Tree Fund. This is the time of year that fundraising letters are sent out. The Fund is available to help town folk with financial needs. There are times when almost everyone has an unanticipated expense, so it is wonderful to know that this resource is available. Please consider giving. In addition, the Plymouth Memory Tree is hosting a holiday gathering on Sunday, 12/9 at the Community Center from 3-4 PM, followed by the lighting of the tree. Refreshments will be served. The Schoolhouse playroom will be open for kids to play and for families to learn more about the Schoolhouse program. Names of those to be remembered will be read at the 4 PM Tree Lighting Ceremony. A couple of weeks ago there was a lovely birthday party for Lonnie Ennis. 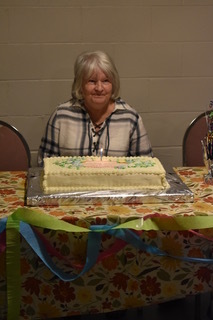 It was held in the Community Room of Tyson Church and included all 4 of her children and her grandchildren, plus several neighbors and friends as well. Her granddaughter, Teresa, a master pastry chef, made a lovely carrot cake for the occasion! This entry was posted in Community News, Events and tagged Plymouth Community Center, Plymouth Memory Tree, The Schoolhouse, Tyson Congregational Church. Bookmark the permalink.